I met some of the team from the Raw Vegan Chocolate Company and was so chuffed with their huge range of raw, vegan products. Creating this post with Linus Gorpe was so interesting. It truly shows that our passions and beliefs can lead us anywhere we want them to! Over to Linus to tell you all about how the idea of this company came about, where it's got to and all the good things that they're not willing to sacrifice for the sake of wealth. What does The Raw Chocolate Company specialise in selling? We make raw chocolate bars, raw chocolate snacks and also have a range of supreme foods so that people can come up with their own creations. I’d like to think that we specialise in positivity, freedom and creativity. Where is The Raw Chocolate Company based? We started off in my kitchen in Brighton and then moved just outside Henfield in Sussex. Does The Raw Chocolate Company ship products all over the globe? Yes, through our website we ship everywhere and we have distributors in Iceland, Sweden, Norway, Finland, Denmark, France, Portugal, Estonia, Lithuania, Slovakia, Slovenia, Holland, Czech Republic, Cyprus, Japan, Australia. Canada, Hong Kong and UAE are coming soon. In the raw food world it generally means that the food has not gone over 42°C from the moment it was harvested, to when it landed on your plate. This is because, over this temperature, enzymes and nutrients start to be destroyed and the body is more likely to treat the food as a toxin rather than a benefit. In reality the figure is different for different food stuffs and some people have up to 47°C as a limit. What inspired you to create a business that solely focuses on raw chocolate? It started with looking at my own diet and a concern for those of my son. So many ‘healthy’ snacks and alternatives just aren’t much fun at all, they are more like wearing (or eating!) a hair shirt! So I started playing around in the kitchen, having fun with nutritious foods, creating fruit and nut/seed balls and coating them in chocolate. They were a massive hit at school fairs, so we started to think about how we could make the chocolate better. Years and years of learning, experimenting, making mistakes and chocolate messes passed, before we came around to realising that ‘good’, ‘healthy’ and ‘high quality’ chocolate meant raw, organic, fair-trade vegan chocolate. So we set about inventing a way to make it. Why is raw chocolate better than those which aren't raw? Chocolate has the potential to be an amazing, a superfood but most chocolate isn’t raw. Therefore it is much lower in nutrients and the body treats it in different ways. We wanted to make chocolate that was good for our insides, taste good, and be good for the environment and the people that grow it too! So we make raw chocolate, that tastes great, feels fabulous when you eat it and also is packed full of nutrients, vitamins and antioxidants. Also, because we want our chocolate to be raw and vegan, it is purer than most chocolates, with no added silly things! Originally it was not easy at all, but over the years, our demands for organic, raw and fairtrade ingredients has grown and this means that it is now relatively easy to get the ingredients. What is not so easy is to come up with the recipes! A lot of vegan chocolate is traditionally very dark and quite bitter. We wanted to make a bar that was the antithesis of this so we came up with our Vanoffe bar – it is now our most popular creation. It is like a white chocolate, but without the milk and the refined sugar. We use Lucuma – a maple tasting fruit from Peru – Vanilla and Coconut Sugar which has a wonderful butterscotch flavour to it. In terms of cruelty, we are all about fairtrade! We don't want to be part of any cruelty to other human beings as well as animals. Therefore, all our cacao is fairtrade, which means that the farmers get a decent price for their cacao, but also that the communities get support and resources to increase their overall sustainability. Do these ingredients effect the outcome in comparison with non raw vegan chocolates? Raw chocolate has a much wider spectrum of flavour. It is deeper and more complex. Recent studies have also shown that processing cacao beans (through roasting, alkalising, adding sugar and dairy), reduces the level of flavanoids, which is the great part of chocolate! Amongst a wide range of other health benefits, it can actually help displace cholesterol in the body. Further, A lot of vegan chocolate still has soy in it, which really has no place in chocolate. Soy is also questionable in terms of both digestibility and GM status. There are some reports that soy can no longer be guaranteed GM free. For someone who hasn't tasted your chocolates before, which are the three most popular? Vanoffe is our best seller in the UK, it is creamy and sweet, some say tasting a lot like a Daim or Caramac bar. The name Vanoffe is a word we made up to describe the flavour – Vanilla/Toffee. In Scandinavia Pitch Dark is the most popular. It is pure – only three ingredients and 72% cacao, just the right amount we think. Vanoffe Dark is my favourite which I have at least once a day. 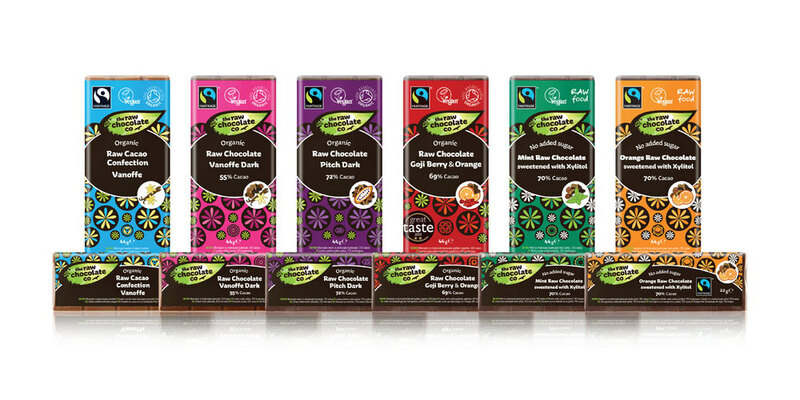 Our Goji and Orange won two gold stars in the Great Taste Awards in 2013, rating it as the best chocolate bar in the UK. that does test on animals or sell non-vegan products? Tell me a bit about yourself before you launched The Raw Chocolate Company? Well I had never ran a company before, nor made chocolate! The only real transferrable skills I had from any of my previous experiences was, to place NO limit to my ability to be creative or anything else! I have always had a sense of ‘fairness’, compassion and fun and when my eyes started to open up to the possibilities of nutrition and wellness, things grew from there. Previous things I have done include property development and tree surgery, but I do have an overriding passion for learning new skills, relaxing and eating chocolate. What is your vision for the future of The Raw Chocolate Company? We want to create fun, conscious foods that are of high quality, that are extremely nutritious and made from the heart. People should have freedom to enjoy food and create their own food too, whatever their dietary backgrounds. We’re going to grow....we are growing, doubling in size again this year. But these elements will remain at the centre of what we do. This also affects how we grow and the rate at which we do. Soon we will be launching an expansion of our raw chocolate snacks range – to the raw chocolate mulberries, goji berries and raisins we are adding raw chocolate almonds, sweet apricot kernels, golden berries and Vanoffe mulberries. The Vanoffe mulberries are great because they have been designed by our fans. We had been asked to make them for years. We made a batch and released them to fans and got their feedback, tweaked them and sent some more back out. After four iterations, we sent out two versions to 50 people, for them to taste them with their own peer groups. In total we’ve had over 500 people contributing to the design of the Vanoffe mulberries. We’re really excited to launch them. We’re also going to be adding to our supreme foods range – giving people more possibilities to enhance their food and create amazingness for themselves. If you would like to buy some of The Raw Chocolate Company's range then you're in luck if you order between 2nd March and then end of April! If you enter the code PlantShift15, you will receive 15% off everything. The code is case sensitive.